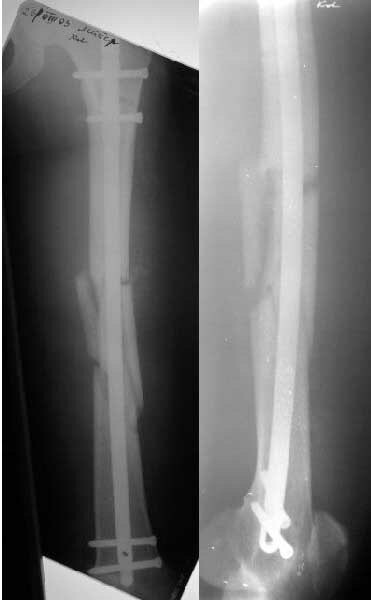 Femur Fx - Antegrade or Retrograde Interlocking nail? 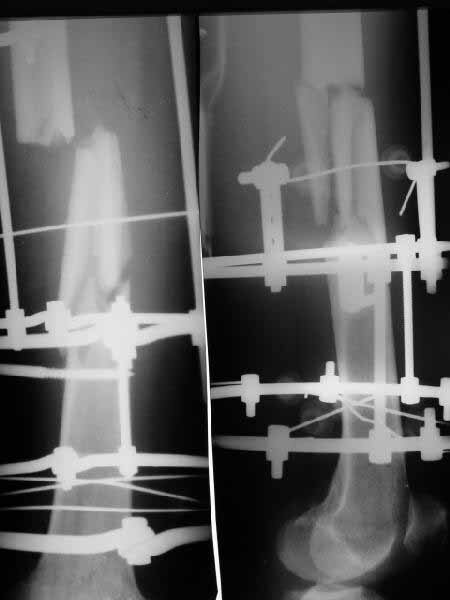 Subject: Femur Fx - Antegrade or Retrograde Interlocking nail? A male 28 years old was referred to our unit with segmental femoral fracture fixed by the Ilizarov 6 weeks ago. Conversion to a locked nail is planned but i am still undefined about the nail should better be inserted through either the piriformis or the knee. He also weared below knee casts because of both feet injuries. Is there any rationale for the choice except tossing a coin? Having used a lot of both,I definitely vote for antegrade nail. You don't needlessly breach a joint,there are more size choices,distal locking is easier( the "distal" screws in a long retrograde nail being in the A/P orientation) and exchange nailing and reaming are easier. In view of the segmental fragments a case could be made for unreamed antegrade nail,with a view to exchange nailing if there is delayed union. I'll vote for antegrade as well. If you get a septic complication in a retrograde nail, the knee joint is a major problem. I suppose closed nailing was not available there, so they preferred ex-fix rather than open plating or plaster cast. Our series of ex-fix to nail conversion now consist of more than 30 cases, and about 15 were acute conversion of fixators 3-11 months old with calm pin sites - no infection to date (knock-knock). OK, since voting was 5:0 for antegrade, the case has just been managed this way. Fixator appeared to be in malrotation about 40 degrees. Though some difficulties were met with gaining of proper length and pushing the nail between parts of the comminuted fragment, the result seems satisfactory. VMI> 2) which nail was used solid or cannulated and the size? Solid UFN-like 11.5 mm 40 cm. I already mentioned that we haven't ever met deep infection after acute conversion of fixators up to 11 months old to solid nails. Of course without visible signs of infection. In case of drainage of pus nailing would be postponed. VMI> 4) why not post the postop Xray. THX again for all colleagues discussed the situation. I favor antegrade approach. Retrograde in obese patients or polytrauma as you can operate on other injuries in one prep without repositioning on fracture table. I find the biggest controversy to be the issue or immediate or delayed exchange given ex-fix thin wires. What are you or did you do in terms of timing wire removal and rod insertion?